Modeled after Guy Fieri and the Food Network program, “Diners, Drive-Ins, and Dives,” Commissioner Edelblut launched a video series to profile some of the state’s cafeterias — giving viewers an inside look at all the hard work that goes on behind the scenes to make school lunch happen. In each video, beginning with Exeter High School, Edelblut discusses and prepares food with staff, serving students and then later joining them for a quick bite. Commissioner Edelblut visited Exeter High School on March 21, donning a pink “Live Free and Healthy” SAU 16 meal program shirt and blue apron while he got to work. Meal preparation began at 7 a.m., in order to be ready for the first lunch period at 11:10 a.m. 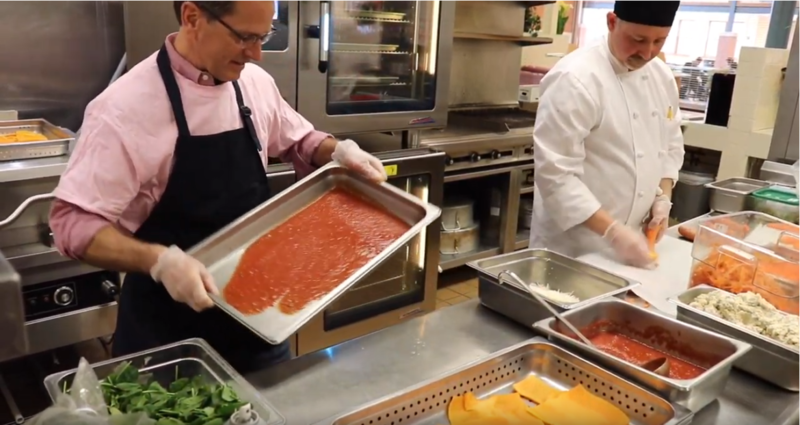 Throughout the video, Exeter High School cafeteria staff — including Unit Manager Louise Sucu, Chef Brad Rice, Chef Michele Simiele, Hope McDonald, Annette Flanders and Jana Toomey — guided Edelblut through the meal prep process. This included letting him take the lead on making a pan of butternut squash vegan lasagna and pulling homemade pizzas out of the oven before slicing them for individual serving sizes.